Lentil bolognese is a thick and hearty vegetarian pasta sauce option. Also delicious over summer squash noodles, polenta or your favorite grain. Bolognese is one of those nostalgic family recipes for me. It’s the meal my brother requests my mom make for any special occasion and just the smell of it cooking down on the stove instantly makes me think of late afternoon Sunday dinners, huge pasta filled bowls, extra bolognese sitting in a fancy saucer only our parents’ generation would own, a hunk of parmesan bigger than my head waiting to be grated on top and of course, endless bottles of red wine to go along with the meal. *This post is sponsored by USA Pulses & Pulse Canada, a 2017 partner of Running to the Kitchen. Bolognese meals would usually mean my grandfather (or grandmother before she passed) invited over to feast too which, also meant a legit dessert wasn’t far behind the meal. If grandpa was over, this almost always meant sfogliatelle and cannolis, aka: the most delicious, carb-filled meal from start to finish you could possibly imagine. The teenage “didn’t care about macros, nutrition and diet because she’d run it all off on the soccer field” me thoroughly enjoyed every second those meals. Sometimes, I think it’d be nice to just turn time back to that version of myself, ignorance truly is bliss. I was thinking about those memories recently and with some perfectly fresh summer basil sitting on my kitchen windowsill, inspired to create a lighter, slightly healthier approach to the nostalgic bolognese of my childhood. Lentils popped into my head as a great way to do that. They provide that same hearty satiety that meat has in a protein packed vegetarian way. I chose green lentils for this lentil Bolognese purposely. They stand up to longer cooking times much better than some of the other varieties and can handle the necessary simmer time a good bolognese sauce requires. 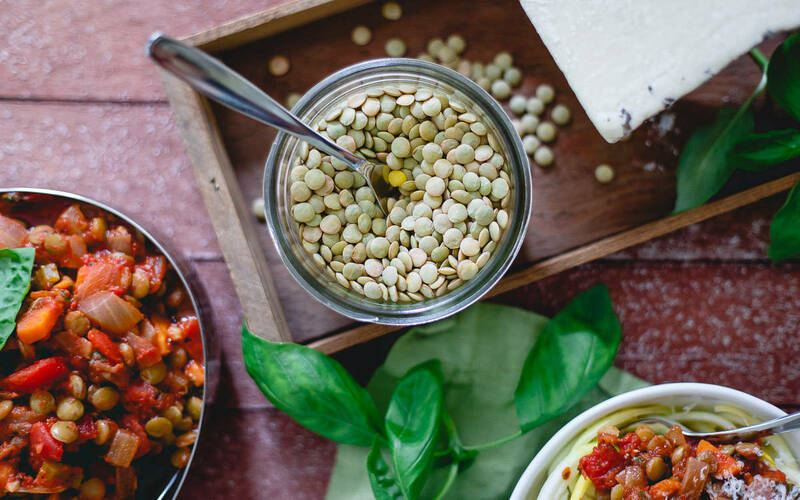 Lentils, along with all other pulses (chickpeas, dry peas and beans) are a great, easy way to add some fiber and essential nutrients in your diet. With 1/2 cup of lentils per serving in this lentil bolognese, you’d be well on your way to rocking out the Half-Cup Habit challenge (sign up to learn more!) to eat 1/2 cup of pulses 3x a week. 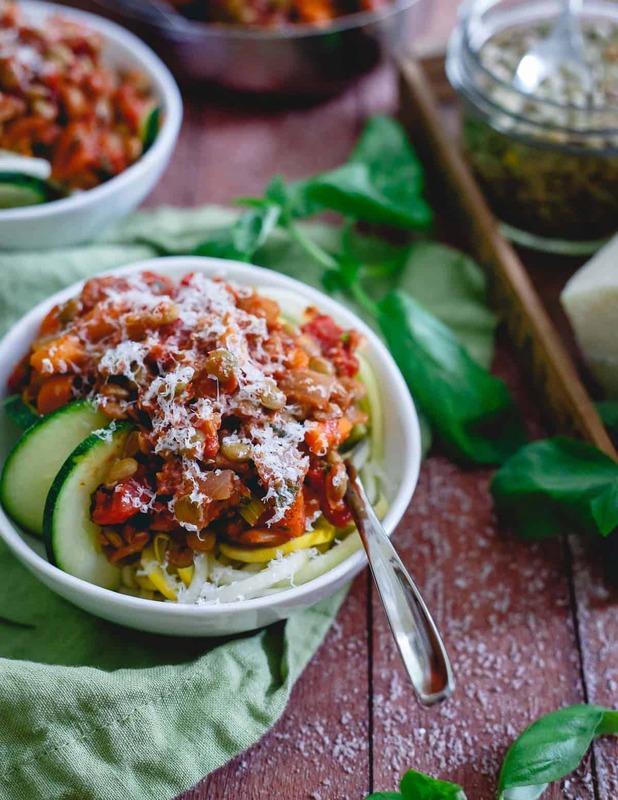 While I’ll never boo-hoo pasta (it might be my first true love to be honest), this lighter take on bolognese for summer really pairs well with some zucchini noodles. You could keep things vegan with a sprinkle of nutritional yeast on top of the lentil bolognese or, if you’re like me, a respectable dose of some freshly grated parmesan for nostalgic measure. For more lentil based recipes, try this lentil vegetable soup, these red curry vegetable lentils or, this Moroccan lamb lentil stew. Add lentils to a medium saucepot and cover with water. Bring to a boil on the stove-top then reduce to a medium-low simmer. Cook uncovered for about 15-20 minutes until cooked through but still have a bit of crunch/texture to them. You don’t want them mushy as they will cook again in the sauce. Add water as needed while cooking to keep lentils covered. Drain and set aside. While lentils cook, add olive oil to a large skillet over medium heat. Add onions, carrot and celery and cook for about 5 minutes until softened. Add the garlic to the skillet, cook another minute until fragrant then add the tomato paste and stir to combine with the onion mixture. Add the oregano, basil, red pepper flakes, salt and pepper and stir again to combine. Add the red wine to the skillet, stir and cook for 1 minute until most of the wine has cooked off. Add both diced and crushed tomatoes, stir, reduce heat to medium-low and cook for 10 minutes. Add the lentils to the skillet, cook an additional 7-10 minutes, stirring occasionally. Season with more salt and pepper to taste. Add the parsley and basil, stir one last time and remove from heat. Serve with pasta, squash noodles, polenta or grain of choice. This looks really delicious and hearty. Can’t wait to try it! This is just the coolest thing ever ~ and my husband happens to go crazy for lentils, so I have to make it for him. I once made a bolognese sauce with mushrooms and I was blown away by how good it was, we didn’t miss the meat all! I have TOTALLY been loving on lentils lately. The idea of using them in a classic meat sauce is just SO brilliant! I LOVE your suggestion to serve this over zoodles. What a beautiful dish! What a great healthy change up to the traditional bolognese Gina! So creative. 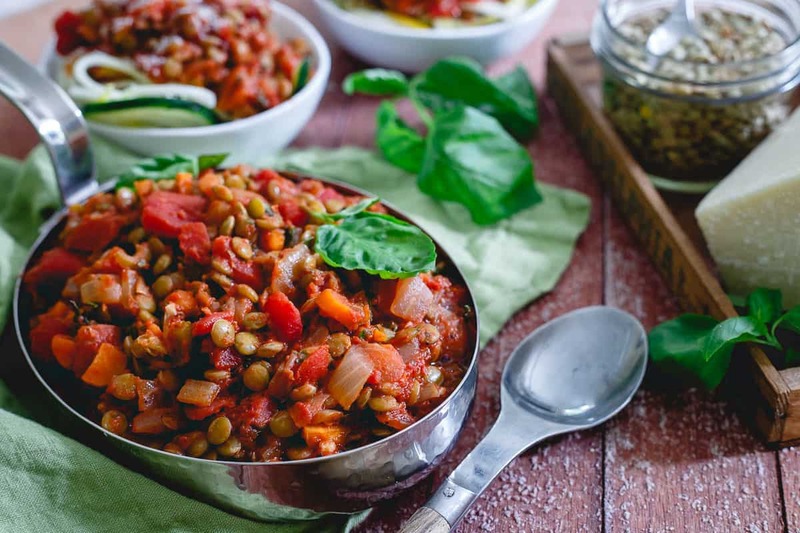 We love lentils, so I’ll definitely need to give your recipe a try! I’ve been wanting to try a lentil bolognese!! This one looks so hearty and delicious! So creative, love this healthy, summer meal! I actually bought a whole bunch of lentils the other day haha. I rarely eat them, but I’m trying to get back into eating them since they’re so good for ya! This recipe looks wonderful. Comforting yet healthy! Perfect as we move into crisper weather (hopefully not for a while, though!). This looks incredible! Totally going to try this! This looks incredible! Lentils are my favorite! 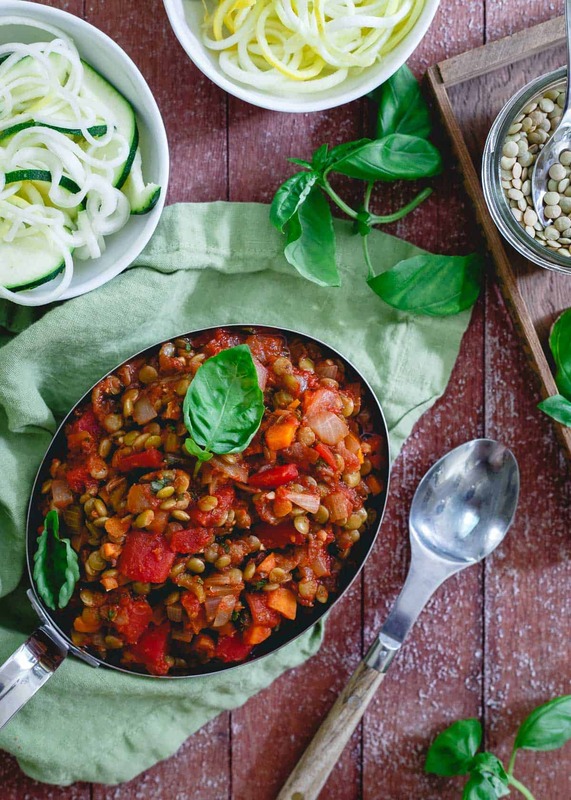 I love lentils and this looks amazing! OMG love your idea of serving this over polenta! I love the nutrient boost! This is seriously gorgeous. I love a pretty bolognese. Perfect! thank you so much, I made it today, and i loved it! Made this as written and it is delicious. Served it over whole wheat linguine for a birthday dinner that was well received, thank you.